Amethyst is a deep purple with a subtle shimmer in low light but a lovely holographic finish in direct light. Even though the holo is not a super intense, the combination of the holo with the purple creates a pretty golden-green shift that I love! The formula was nice and shown is 3 thin coats. Tom Boy is dusty red-violet jelly filled with tiny silver micro flakies. The silver flecks are again subtle, but really pretty! The first coat of this was very sheer (though the application was a breeze) and I wasn't sure if this would be able to reach opacity on it's own...but shown is just 3 coats! Unicornucopia is as the name suggests - a cornucopia of unicorn...everything! It's a crazy intense silver holo that has 7 different types of holographic glitter or pigments as well as some small purple and teal hex glitters and medium sized holo dots. 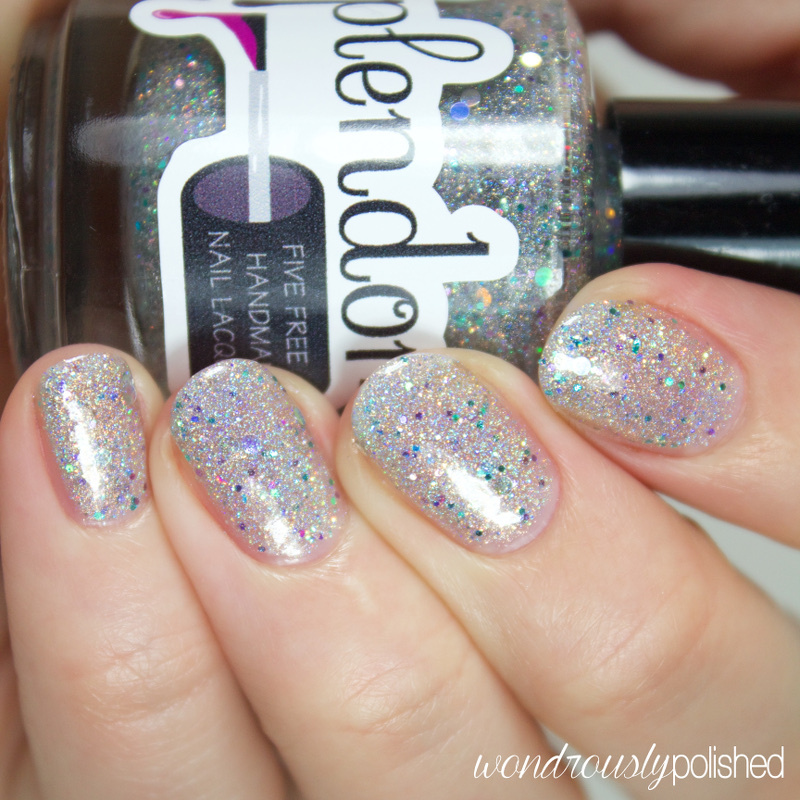 I love that this isn't your run of the mill silver holo - the added glitters really make this one for me! I was pleasantly surprised to find that this almost reached opacity with just 3 coats (though you can still see some natural nail underneath, the light hitting the holo makes it hard to tell). Winter Skies is a muted lavender with a subtle holographic finish. This one is really similar to Amethyst, but it's a more subdued version that I still really enjoy. The formula was great and I only needed 2 thin coats for this. Smiling Ice Cube is a dark spring green jelly with a scattering of holographic and pink shimmer. I wasn't so sure about this one in the bottle but I loved it on the nail! So pretty (and it's a green! Yay!). This one has a similar formula to Tom Boy, especially in that I wasn't sure it would reach opacity, but 3 coats did the trick. And finally, Cosmic Inkpool! This is a blackened indigo jelly with deep blue shimmer and varying sizes of holographic glitters! It's basically a galaxy in a bottle and I'm obsessed with it. The blue shimmer isn't as noticeable until it's in direct light, but it's stunning in low lighting as well. You could probably get away with 2 coats of this, but I've shown it with 3. This is definitely my favorite of the bunch! Overall, I quite like this collection! I love that all the polishes are easily build-able in coverage and that they're in celebration of Leslee's birthday. I think the standouts for me are Cosmic Inkpool and Unicornicopia! You can purchase these individually for $8.50-$9.35 CAD/bottle (or $7.01-$7.71 USD/bottle) during the pre-sale (15% off) or $10-$11 CAD/bottle after the pre-sale ends on March 1st. The entire collection is also on sale during the pre-order for 35% off! Be sure to follow Splendor on your favorite social media site to stay up to day with the latest collections and promotions!